After you have had an interview with Vanessa and you confirmed as attending the School you might have lots of have questions, so we have compiled a list of the most frequently asked queries here, and some of the health and safety and privacy agreements when attending The Sourdough School. Please take the time to read through these as all of the information you need to attend the course is covered below. Simply click on the question to reveal the answer – please read all of the details. What happens if I need help with my baking when I get home? One of the benefits of being a student at The Sourdough School is the ongoing support we provide so that you can continue your sourdough journey with confidence after you have studied with us. This is important, because when you leave the school your learning has only just begun, and every time you bake you will learn more about the process. Part of this support is the ability to have a conversation with Vanessa about your sourdough baking. There may be times when things aren’t going as you would like, and you really need some help in identifying the problem. Vanessa is often able to do this, but it is important that you provide her with a full set of information so that she can work through the problem with you. To make this easier she has developed a Loaf Analysis Form, which guides you through gathering all the information she needs. Using your answers to the questions on the form, she is usually able to diagnose the problem and advise you on how to fix it. It gives her a starting point and also acts as an invaluable tool for your own records. If you feel you have a sourdough problem that would benefit from a chat with Vanessa, the first thing to do is read through the Loaf Analysis Form here. Answer all of the questions. This does take some time but the more information you can provide, the more Vanessa has to work on. You will also need to upload photos of your starter, leaven and loaf – the form gives full details of what’s needed. Once you have completed the form, the information can be sent to Vanessa and you can arrange a convenient time to go through it. How do I get my sourdough starter home? When you leave the school, we supply you with a small pot which contains 80g of sourdough starter. We also give you a bag for the starter to travel in. We refresh the starter on the last day of the course before you leave, to ensure it’s at the optimum point and ready to travel home. We also supply small bags of flour, so if anybody needs to continue refreshing their sourdough starter for a few days before they go home or on the journey, then they are able to do so. Keeping your starter healthy is a very simple process, and will be fully explained on the course. But essentially, to refresh your starter you take ¾ (60g) of the starter out of the 80g we give you. Then stir 35g of water and 25g of flour into the remaining ¼. All you'll need is a small spoon or, at a push, you can use your fingers for mixing. This ratio of flour and water keeps your starter slightly thicker than you would normally have it, which slows down the rate at which the bacteria consume their food source. There are a couple of considerations to bear in mind when you are travelling – the main one to remember is that your sourdough starter is still fermenting, and is going to be producing gas. It’s worth opening the lid every few hours to release these. If you forget, the worst that can happen is that the gases build up and pop the lid so that a little of it spills out into the plastic bag. This isn’t really a problem because you can simply wash the starter out of the plastic bag when you get home, although you will only need 20-25g of it to refresh anyway. Taking your sourdough on an aeroplane. I don’t recommend keeping the bags of flour in your hand luggage, because more than likely you will be stopped and have it tested at the airport. But I do prefer to carry my starter in hand luggage. It can safely travel in the hold. It will get cold, but certainly shouldn’t come to any harm. If you decide to take it in your hand luggage, remember that it will be subject to the restrictions on liquids and gels, so don’t try to carry too much. I also find it helps to clearly label the container or bag with the contents… if nothing else it can lead to some interesting conversations at security! It’s really not a problem to travel with your sourdough starter. I’ve taken mine all over the world. In fact, the sourdough starter you will be leaving The Sourdough School with is part of a starter that has already been all over Europe, as well as to India and the USA. So we’re sharing a very well-travelled starter with you! What are the Course Start time & End Times? Most days we run 10am - 6pm HOWEVER each course has it's own schedule so please be sure to check your PDF that has been emailed to you as this will have the start times for your individual course. Courses start on time however... it is VERY important NOT TO TURN UP EARLY. The arrival time is fixed. 10am. Time is needed to prepare for the course, and the last 10 or 15 minutes is a bit like having a dinner party, and getting everything in order and myself ready is unbelievably hectic. If being early is completely unavoidable please let me know 2 days in advance. Courses finish at 6pm. We recommend you book taxis at 6:15 to allow for a few minutes if we over run. It takes about 20 minutes to get to the train station in Northampton. We have lots of choice and a help yourself policy. There is always a vegetarian and vegan choice. We have almost all of our lunch menu recipes listed on the website. Please do ensure that you check out the recipes for any allergies. We occasionally serve local seasonal smoked, or preserved fish or meat, in general lunch is simple, home-made, seasonal, and based around the bread we are eating. Almost all cheeses are British and unpasteurised, so please do let me know if you are not able to eat unpasteurised cheese. With a few days notice we can provide alternatives. We are not a nut free environment. We respectfully ask that students bring medication if they have serious allergies or are allergic to animals. We do keep them out of the way but all the same, we still need to ensure medication is on hand, just in case. I am a trained St Johns Ambulance first-aider, please let me know of any other medical conditions on the day if they are not detailed on the booking form. Our policy about sourdough social media is to celebrate and share. We tend to avoid focusing on an individual but occasionally we live-video to share tips and information to others, and often take pictures of people’s hands and bread. We are sensitive to both those who love social media and also those that don’t, so please be respectful of each other’s preferences. Photos of me when you ask me are absolutely fine but please do ask first and let me have a moment to make sure my eyes are open and my mouth is closed! Photos of the house are fine too and garden but not our living space. No photos of the children please (unless I expressly give permission). Any complaints or worries or loaves not turning out as you want, then do please address to me at the time not broadcast to thousands first... Please connect, share, celebrate and enjoy. Do you recommend anywhere to stay? Often our students are traveling from abroad and meeting bakers from around the world is very sociable so we suggest that students stay nearby at Sedgebrook Hall. The Hall is set in beautiful grounds and is walking distance (about a 15 - 20 minute walk about mile away from the school) and has a restaurant and bar, and a small gym and swimming pool. We have arranged a discount code for our students. Please use code SOURDOU for the same online 10% discount but no payment required at booking. We do advise that you BOOK your accommodation as soon as you have booked your place on the course, as there are often events in the area. Although it is walking distance we also suggest that you do not walk this route in the winter months as it gets dark from October until May and it is a rural road with fast traffic. We often find that students arrange shared transport to and from the school, when they say in the same accommodation, but as this is a private arrangement between individuals, and we therefore leave this entirely up to individuals to organise themselves should they so wish. However there is list of taxi companies in this Q & A if you wish to book transport. We do have other recommended accommodation options here if needed - a full list of accommodation in the area. We have compiled a list of things do and places to visit if you are bringing someone with you or staying for longer. We have noticed that the Black cabs from the train station can cost a lot more and often cannot find us. Also please book your return taxi! We are slightly outside of the town and sometimes taxis are not available at busy times at short notice. Often Students want to arrange taxi sharing, or lifts with other students, but we are not able to be involved. This is at your own risk. 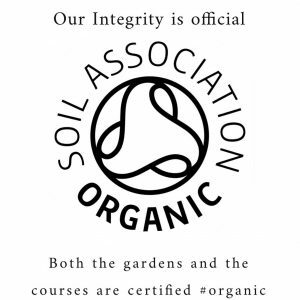 This is a personal arrangement between people attending the course please be aware that we hold no responsibility or liability whatsoever for any arrangements made privately. Do I really need a Sourdough School Book? Yes. 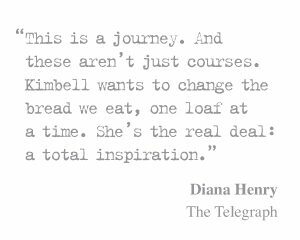 You will really enjoy the course so much more of you have a copy of ‘The Sourdough School’ book. We use it throughout the course. Why don't we include them in the course? Well it got just so complicated trying to arrange books because so many students already have a copy of our book, and I can't buy it for less than Amazon. Unbelievably, Amazon is often much less expensive than we can even buy the book for ourselves from the publisher, so we decided to ask students to bring their own or let us know and we will have some here to buy. Please note, however, that if you can read the book and familiarise your self with the stage of making sourdough then you will get allot more form the course. If you really don't want to buy one you can borrow a school copy and use my online teaching notes when you get home. Are there any copies of your other books? Generally there are copies of my book ‘Food for Thought’ to buy but we rarely have ‘Prepped’ stocked so please feel free to bring your own copies if you’d like them signing. Again these are much less expensive if you buy them online as I have to pay wholesale prices when we buy them. The Pets are part of the Staff. The dogs bark to alert us that there are people here, and the cats keep the mice away, so we don't need poison or traps in an old property. I have one cat in particular who does love to try and make himself comfortable, and dogs, chickens and wildlife. The dogs are NOT allowed in the school and not in the food prep areas under any circumstances, although as many might appreciate cats do not know boundaries. We politely request that guests do not encourage the animals into the school as we have them trained not to come in. I often leave the dogs out in the garden until the last 5 minutes before the course start time for some fresh air and my terrier is a rescue dog and not friendly. Please do not fuss the terrier. If you have an allergy we will do our best to keep the pets away, however, we ask that you bring any medication that you need as we cannot promise that they will not set allergies off. Is there time and space for prayer or meditation? Baking in very spiritual and we respect everyones beliefs. We have people travelling from all over the world and make time and space for religious and spiritual needs – please let us know if you need anything specific. We have a small quiet room upstairs, a shower room, and full of bread books that is available, we are able to lock the dogs away whilst people are arriving or leaving, and we are able to accommodate somewhere separate to sit within the bakery away from alcohol should we be serving. When you arrive you will be asked to put your personal belongings upstairs. The School is a relaxed space for baking and learning. As a small business however, we have to have health and safety procedures so we have an office where all bags, coats, hats and personal belongings need to be stored out of the way. All students are required to wear an apron, and have no rings on hands unless a simple wedding band. Whilst baking please have hair tied back. We have a separate hand basin for hand washing. This is NOT for washing utensils. NO personal belongings, clothing or bag in the school except your phone or medicine please. Over the years I have noticed that accidents tend to happen when things get cluttered. We have to clear the table several times over the day, and each student has an apple crate as a locker, and is responsible for making sure that their utensils, cup and bowls are washed and put away whilst baking and when finished with. You will need to keep your working area clear and it is requested that you tuck in stools under the table when baking as people can trip over them. On arrival we are all allocated one small job to make sure that the bakery stays ship shape throughout the day. It is very calm and comfortable, so I ask that students make themselves at home, but also to be mindful of the working space. I am St Johns Ambulance advanced first aider trained. Is there any continued support when I get home? Once you have completed the course then you will be invited to have access to the School notes with over 300 articles and recipes to back up the course and the Student Forum to feedback your loves that you bake to me. Please make sure the you join and fill in your details with a photo of yourself. The Student Sourdough notes give you private continued support with me, a forum with all other members, and hundreds of articles and features constantly updated with offers and new formulas. When you have attended one of Vanessa Kimbell's sourdough courses you automatically have access to the Sourdough School Lessons. Vanessa often refers to them as Class Notes. The forum is an area that you can interact directly with each other and chat to Vanessa. You can upload photos and comments to your own profile and chat and comment on other Students posts. The Student directory means that you can connect to all the other members, all over the world, keep on leaning and stay inspired. 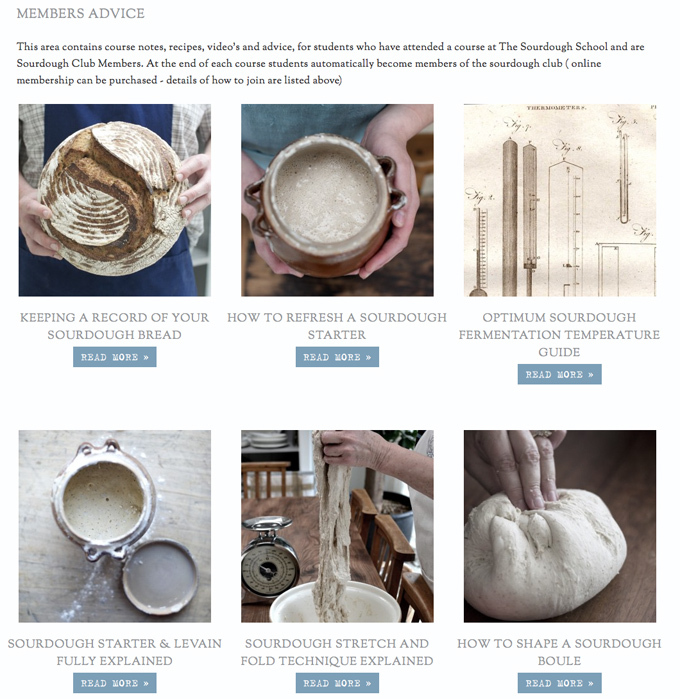 More importantly your membership means you can read through Vanessa's SOURDOUGH ADVICE pages to increase your knowledge, and there are new recipes and challenges that go up regularly. Students have exclusive access to Vanessa's SOURDOUGH RECIPES and teaching information for the sourdough beginners courses. Students also have full access to instructional video's, charts, and step by step instructions. 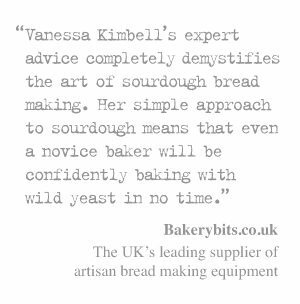 Our Students are also able to contact Vanessa for specific advice about their sourdough. 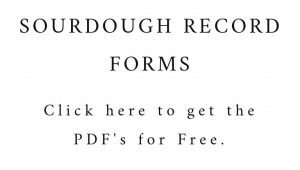 You will get previews and exclusives of any sourdough related events, books, and news. How do I get a login for the student area? How do interact with other members? We have several researchers that work for the School and the papers are available on request. All the studies though, are listed and reference and summarised on the sourdough club pages. What can you expect when you come to a course? You can expect a warm welcome, and to work hard and learn plenty. It's fun and small groups make friends. It is however a big commitment both financially and in time, so it is important for you to research your week thoroughly. We are always happy to answer questions, but there are a few things we can share to fill in any gaps. Well it is fair to say that we hope for lovely people, who want to learn everything we can teach you about sourdough. We need you to be punctual, be well prepared, with long hair tied back, short finger nails, with a full apron and raring to go. We also expect our students to continue their baking when they get home, which is why we have The Sourdough Club and give feedback and support long after the course had finished. What should I expect on a Diploma Course? Whist the teaching will centre on every aspect of sourdough bread and there will still be time to savour your bread, to relax, to breathe deeply and just lose yourself in long, slow fermentation and in the beauty of winter in our rural Northamptonshire setting. We will try to incorporate a walk into each day’s schedule, weather permitting. You will have some free time in the evenings, and there is the opportunity to walk, cycle, visit the local pubs, or pop in the local cheese mongers and bakery, and we arrange a visit to the local vineyard. The course aim is to give you the confidence and know-how to bake your own homemade, artisan, sourdough loaves. It will be a fun week, full of information, demonstrations and baking. All participants will receive a certificate of attendance. Once you have booked a full schedule will be sent to you. Will I make the perfect loaf? Something to bear in mind. It took many years to master Sourdough. It is an art and sourdough is wild. Fermentation is unpredictable at times and many students often arrive with very high expectations. Often people show me loaves they want to make by bakers that have baked over 500,000 loaves. Yes they are amazing. However, it takes years to really master sourdough. It is like learning to play a musical instrument, and although you will attend a course for a few days or even a week, it takes most bakers a three year apprenticeship to learn to bake sourdough and even now 35 year on I am still learning every time I bake. Be ready to learn. On the day sometimes things don’t always go according to plan... although mostly it does; It is somewhat ironic but we learn more from the mistakes that we do the successes. What you will learn here is not just to follow a recipe, you will learn core principles and to trust your senses, to have an understanding and a sense of rhythm, timing and connection, to the dough and the process of making bread. You will make great bread and learn everything you need to know to be in a position to practice with knowledge. Then it is up to you to bake. Over and over again. That is the joy - the journey. The School is in the grounds of our home. It is not open to the public, and why we do not publish our address. The Sourdough School Ltd, East Bank House, Moulton Road, Pitsford. Please use PITSFORD as your destination. Using the SatNavs post code will take you 150 yards up the road or to the wrong village. From the A508 drive all the way through the village until you come to the first bend. Look for the two white cottages on the right hand side as you go around the bend there is an old blue five bar gate before the zigzags of the zebra crossing. Coming from Moulton village we are the first gate on the left hand side after Drummond Close and before the white cottages. The gate is where the zig zags of the zebra crossing end. There is lots of parking nearby as we are in a small rural village in a residential area. You can park all day for free. I do however have neighbours that are visually impaired and another neighbour who needs wheelchair access on the pavements. Unfortunately in the past we have had several students park inconsiderately which caused upset to both my neighbours and my students, who have had to leave during the class to re-park their cars. so please do park considerately. We are also doing works on our driveway so parking on our driveway is not possible. Occasionally you find spaces on the opposite side of the road to the school, but there have been a few instance of wing mirrors being knocked off as people drive too fast around the corner, so I suggest parking either on the High Street before you reach the Griffin Pub and walk about 50 yards down and round the corner to us, or try parking further down and round to the left by the church, or on Manor Road, all just 1–2 minutes walk away from the school. This is list of things you must do and BRING with you. Please buy The Sourdough School published by Kyle Cathie. Like any learning experience if you can read the book before you come on a course you will learn so much more. PRINT this document to bring with you. Ensure the you have booked a taxi home after the course ends at 6pm. Generally 15 minutes after the course finishes. Check your arrival time is 10am. Do not turn up early. Bring any other of Vanessa's books that you would like signing. 2 x 200ml pots with a lid and a small bottle with lid in case you make pickles or jam or ferments and you want to takes some home. A large bag to take your new things home in. A torch – essential in the winter, as it gets very dark. If it is not you coming on the course then please give this document to the person coming on the course and make sure you have registered the right person attending. What if I don't want buy the book? We will have one spare you can use. It is not totally essential the you have one, but it is shame not to because I refer to it frequently as so many people have bought it before then attend a course that we stopped adding to to the cost of the course. 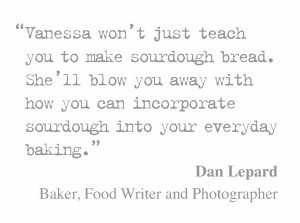 Either from our website, a signed copy or you can buy copy of The Sourdough School book from Amazon if you prefer, but please note we don't always have them in stock here.. Simply you will learn so much more if you have a copy with you. Where is The Sourdough School Based? Vanessa’s Sourdough bread making classes are a world away from the hustle and bustle in a pretty village just 4 miles north of Northamptonshire – which is possibly one of the most easily accessible counties in England. We are within an hours reach of London, Oxford, Milton Keynes, Cambridge, Leicester and Birmingham, which is just 15 – 20 minutes form the M1, the M6 and the A14. The train station is also only a 15 minute taxi ride away, making it really easy to get to us from London on the train. There are regular trains from London Euston and Birmingham to Northampton. Central London – trains go directly from London Euston station to Northampton station and take about 55 minutes. A taxi to the school from Northampton station takes about 15 minutes. If there is ever a problem with the Euston to Northampton line, trains also run from St Pancreas to Wellingborough and Market Harborough both of which are about a 20 minute taxi drive away. Birmingham – trains go from Birmingham to Long Buckby station and take about 40 minutes. A taxi from Long Buckby station to the school is about 15-20 minutes. Long Buckby is a rural station so there are no black cabs here. Check www.nationalrail.co.uk for train times. We are about 15 – 20 minutes away from the station by car, dependent on traffic. We would advise that you pre-book a taxi to take you from the train station to the school, and vice versa. Black cabs at the train station are more expensive. Birmingham – there are regular trains direct from the airport to Long Buckby (about 40 minutes). Then take a taxi to the school (approximately 15 minutes). You will need to pre-book a taxi as this is a small rural train station and there is no taxi rank. Luton – the quickest option is to take a taxi from the airport (approximately 50 minutes) – we have used Skyways Cars before. The most affordable option is the National Express bus service to Northampton town centre which takes about 1 hour 15 minutes. Then take a taxi or the X7 bus from the bus station to the school. The bus stop at the top of Pitsford village is about a 10-15 minute walk to the school. You can book National Express bus journeys online. East Midlands – a taxi from the airport will take a little under an hour. National Express runs two buses each weekday, the journey to Northampton town centre takes either 2 hours 15 minutes or 2 hours 50 minutes depending on which service you take. You will then need to take a taxi or an X7 bus from Northampton town centre to the school. Stanstead – trains run every 20 minutes from Stansted to Tottenham Hale underground from where you can get an underground train to London Euston. Overland trains from Euston run hourly to Northampton. You can then take a taxi or the X7 bus from the bus station to the school. The train station is about a 15 minute walk to the bus station. Heathrow – trains via Euston London take about an hour to Northampton railway station. To get to Euston from Heathrow follow signs for the London Underground, take the Piccadilly Line to Green Park, then the Victoria Line to Euston. Allow an hour to get from Heathrow to Euston. Or you can just take the Piccadilly Line straight to Kings Cross St. Pancras and walk to Euston (about ten minutes). From Northampton train station to get to the school you will need to take a taxi (about 15-20 minutes). If you can pre-book a taxi it will be cheaper. Alternatively you can take a bus to Watford Junction and then the train to Northampton (both run hourly) this takes 2¼ hours. When you are booking flights around a course at The Sourdough School, please allow plenty of time for travel between the school and the airport. There is a stagecoach service which will drop off at the main road on the A508 which is about a 10 – 15 minute walk into the village here – please contact me for more details of which stop is best to get off at. You will need the X7 bus. 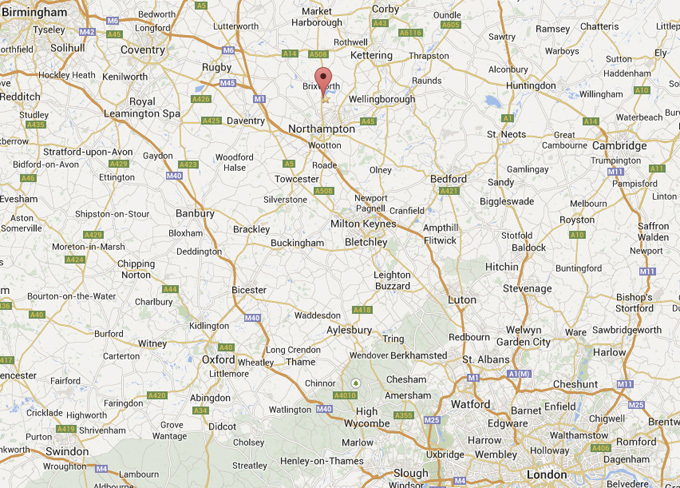 NORTHAMPTON IS BASED WITHIN EASY REACH OF LONDON, OXFORD, CAMBRIDGE, MILTON KEYNES, BIRMINGHAM. There is plenty of parking and you can expect a warm welcome. What is included in a Course? All food and drinks whilst at the school are provided. We will be eating sourdough, local cheeses and simple, delicious homemade food for lunch, and enjoying a glass of award-winning wine from the local vineyard or our own sourdough beer. You will only need to bring a few essentials, your favourite apron, and a large basket to take your bread, your bakes and several other bits and pieces home with you, 3 x 200g tupperware containers with lids to take jam, cultured butter and pickles home (please ensure they are sterile and odourless) and a small plastic bottle (an empty water bottle is good) to take syrups home. International students please allow space in your luggage to take many items back with you. Diploma Students you need to bring a pair of trainers or shoes to walk in, something warm to wear and a flask – we will fill it with hot tea. If you want to cycle then please bring something appropriate to wear – the route is some tarmac and a well-used track, but it can be muddy in places. Please note that we are also mindful that some people want to avoid alcohol, and we have a separate table available, that is still very sociable to eat at. Transport to and from the School. You will need to arrange for your own breakfast and evening meals. Why is the composition of my gut microbiome so important? Over the last few years, there has been a lot of interest in the influence of the gut microbiome on overall health. The microbes that live in our digestive system (about 100 trillion of them) play a hugely important role. These bacteria, fungi, viruses and protozoans form an ecosystem which we are now finding helps in protecting us from diseases, and can boost our mental wellbeing. Research in this field is relatively young and there is much still to discover, but it is becoming obvious that we have a symbiotic relationship with these microbes, and they are central to our health. We know that a healthy, balanced gut microbiome helps us to process food – it is essentially at the heart of a healthy digestive process. The microbes also protect us from infection through interactions with our immune system, and help manufacture vitamins, including vitamin K and vitamin B12. Research shows that these microbes can send signals, via the vagus nerve, to our brain. Through this they may be influencing our mood, our appetite, and even our levels of anxiety. Recent studies have shown that the balance, or imbalance, of the gut microbiome can be linked to a range of conditions such as multiple sclerosis, Parkinson’s disease, and other autoimmune diseases. From what we now understand, the composition of an individual’s microbiome seems to be determined by a combination of what we were seeded with at birth, what we eat and our lifestyle. Things like diet, exercise, the medicines we use and our environment can have a huge effect on our microbes. As a baker who has been researching the role of the microbiome in digestion, my interest has become focused on whether long, slow, fermented sourdough breads can have a positive effect on the gut microbiome. As yet there is no definitive evidence of this. It’s simply the conclusion I have reached having read many studies conducted in laboratories and on laboratory animals. Can you recommend some places to visit and things to do near the school? If you have any other questions not covered here please email us and I will get back to you as soon as possible. Share the post "Essential Information for Attendees"